There's no better way to celebrate Memorial Day than by gathering with friends and family with some good music and chilled drinks in the sunshine state of California. Memorial Day is celebrated on the last Monday of May. It was created to honor those who died in wars or serving their country, and it also serves as a day for personal remembrance for lost loved ones. It's also a three-day holiday weekend that signals the start of the summer season. San Francisco is alive on Memorial Day weekend with your choice of activities. Find a festival that meets your group's interests or keep it low-key and head to the flea market. You can also have fun without going into the city. Try some of these other fun things to do in Northern California over the holiday weekend. Treasure Fest, San Francisco: It used to be called the Treasure Island Flea Market. It's actually held on the last full weekend of every month, not just Memorial Day. You'll find crafters, artists, vintage collectors, food trucks and gourmet entrepreneurs. 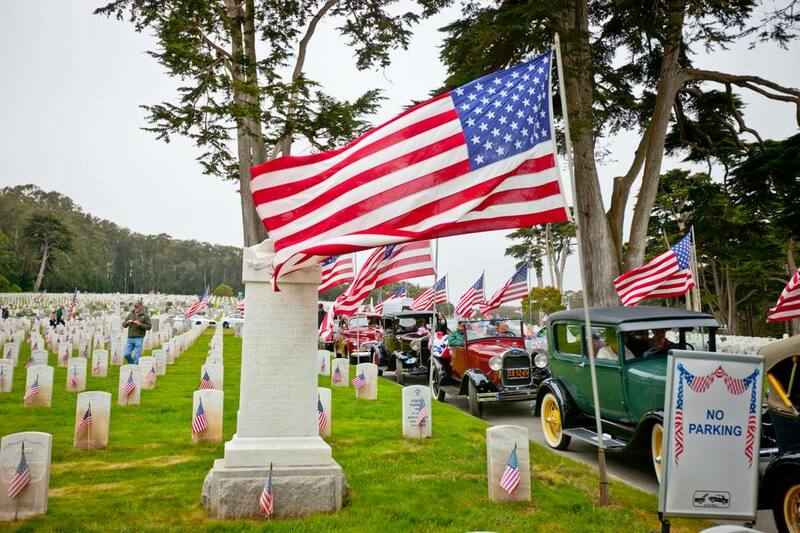 Memorial Day Commemoration at the Presidio, San Francisco: On a more serious note, remember what this holiday is all about. You can honor our military heroes at the former Army base, which includes a parade, a 21-gun salute, and a picnic. BottleRock Music Festival, Napa: The food and music fest lasts all weekend with lots of musical entertainment, food. and wine. This popular event isn't a good one to try at the last minute. It gets crowded and local lodgings put out their "no vacancy" signs months before it starts. Mushroom Mardi Gras, Morgan Hill: You have probably heard about the garlic in nearby Gilroy, but in nearby Morgan Hill, it's all about mushrooms. The free festival focuses on fungi but includes a fun run, free cooking demonstrations, and entertainment. And lots of wine and food options. If you're looking for more places to celebrate Memorial Day in the Los Angeles area, check the full listing of things to do for Memorial Day in Los Angeles. Summer Nights Fireworks, Sea World: The animal park kicks off the summer with a seasonal fireworks display. You could watch it from outside the park anywhere you can see their tower, or buy a ticket and go inside for a better view. Carnation Drop, Palm Springs Air Museum: The museum celebrates the spirit of Memorial Day in a special way: A World War II-era B-25 Mitchell bomber airplane drops thousand of red and white carnations to salute fallen comrades. Mule Days, Bishop: This event is the greatest mule show on earth (or so they say). Events include some you might expect at any rodeo like roping and riding, but others feature mule team skills. The most unusual (and entertaining) is the Pack Scramble. More than 100 horses and mules are stampeded in the arena. A "wild and wooly spectacular" ensues as teams wrangle their mules out of the herd, pack them, and race to the finish line. Lightning in a Bottle, Kern County: The summer campout festival is held at Buena Vista Lake near Bakersfield. It's an annual event that features music, art, yoga, and education on wellness and sustainability. Kinetic Grand Championship, Humboldt County: For a touch of something different, head to Humboldt County to see (and cheer for) the unique, human-powered vehicles that compete. Catalina Island: An extra day on Catalina is always welcome, and you don't have to worry about driving home in traffic - just take the boat. Eureka: It's not the quirky science-infested town from the TV show, but a nice little place on the northern coast that's filled with charming Victorian-style homes. Rent a Houseboat: For an excellent beginning-of-summer blowout grab some friends and rent a houseboat on Lake Shasta or the Sacramento River Delta. Mount Lassen: This volcano last blew its top in 1915, but you'll still find plenty of fire and brimstone simmering beneath the surface - and some great scenery all around. Mendocino: Pretty scenery and relaxing surroundings make "Mendo" a good place to rest up before a busy summer. The California Highway Patrol always increases their presence on highways during Memorial Day weekend, so you'd be prudent to keep your speed in check. Even though those alcoholic beverages consumed at a Memorial Day barbecue seem like fun, don't get in the car and drive afterward. Of course, you can use a ridesharing service, but if you find yourself intoxicated and your vehicle far from home, California's AAA offers their Tipsy Tow program on Memorial Day for anyone in California, whether or not they're a member. Just call 800-222-4357 (AAA-HELP) and tell them you need a "Tipsy Tow." They'll tow you, your friends and anyone else (up to 5 miles). Memorial Day weekend is also one of CalTrans' favorite times to work on road projects, which in some years has included things as disruptive as closing the San Francisco Bay Bridge or a major Los Angeles freeway. Call 800-427-7623 or visit their website to check for road closures.